a heart surrendered: Miscarriage Ministry ... will you comfort others as you were once comforted? Miscarriage Ministry ... will you comfort others as you were once comforted? Do you remember the faces of those who ministered to you during the dark days surrounding the loss of your precious baby? Do you remember the words, the letters, the visits and the gifts that brought glimpses of joy in the midst of your sorrow? Did the Lord use a verse of Scripture or a song to comfort your heart when you thought you couldn't get through the day? Was there someone who sat next to you, listening to you tell your story, express your pain, and your sorrow - without trying to "fix you?" Did anyone love you with the Ministry of Presence - just "being" with you whether a word was spoken or not? Do you remember the first day you did not wake up sad or depressed? Do you remember feeling guilty because you didn't? Do you remember the fear of thinking you would never have a baby? Do you remember laughing again, looking to the future without fear, and slowly learning to trust God without knowing His plans for you? Right now there is another woman walking, crying, and groping in the same darkness where you once lived. She is broken, afraid, confused ... and wondering if any understands her pain. She needs to hear your story. She needs to hear about God's love. His compassion. His mercy and His grace. She needs to experience the same comfort the Lord gave you. Your stories may not be the same, but you understand. Your responses may not look the same, but you understand. You may have absolutely nothing in common, but you understand. Both of you walked into a hospital with a baby in the womb. Both of you left with empty arms. Both of you envisioned an entire life with your child. Both of you had to let go of that dream. Excitement. Gender reveals. Nurseries. Baby clothes. Car seats. Baby books. Showers. And then in one single moment, all of it comes crashing down around you, and you are left sitting on the edge of a hospital bed wondering what in the world just happened? Will you reach out to her? A verse, a word, a song ... anything that calmed and comforted your heart when it was broken like hers. Will you shed the light of HOPE in the darkness that surrounds her? Will you speak TRUTH to remind her how wonderful and amazing God is - even in the midst of her sorrow? Will you take time to write a note of encouragement on pretty stationery, in your own hand, with a prayer of thanksgiving for what the Lord is going to do through your kindness and compassion? 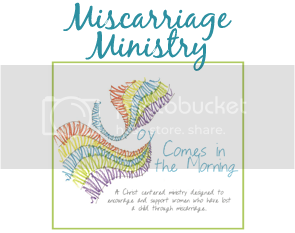 Our Miscarriage Ministry, Joy Comes in the Morning offers something unique - something personal. A woman, or someone who loves her, can request hand-written notes of encouragement from other women who have suffered as she is suffering. We receive a request for letters about once a month, and register hundreds of clicks from people seeking comfort and empathy in a time of deep sorrow. We send a note each month for the next six months. The women often respond, sharing their gratefulness for those who reached out to them - even as strangers - because they understand their pain and know exactly what they need to hear. We have a small team of women who willingly write and I am incredibly grateful for their desire to serve in this special way. Ten women who will prayerfully and joyfully share their hearts with the one who so desperately needs words of HOPE and a reminder that joy DOES come in the morning! His hand is always waiting - to take ours. A concert - and a lesson. 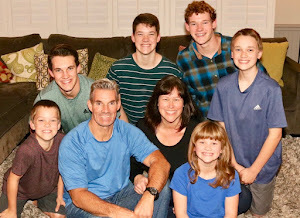 My children don't have to change. I do. Speaking truth - instead of hiding. Why I write the way I write.